coincidentally, means blue in Portuguese. Everything you’ve heard about David is true. He never stops working. In fact, our first call was supposed to be on Friday before his daughter’s wedding. Something else came up and we tried to connect on the Sunday after. Ultimately, he called me after walking off a redeye in New York on Monday morning. He thinks nothing of commuting down to Brazil. He is always thinking about a million things a minute. It’s impressive and, yes, tiring. We had a wide-ranging discussion on everything from fleet decisions in Brazil to his departure from JetBlue. He’s still not happy about that and has a list of things that he thinks JetBlue needs to do. David doesn’t hold any punches, and that’s refreshing. But you’ll have to wait for part three for the JetBlue discussion. Today, we start with talk about Brazil’s fabled air traffic control system and the rapid growth and opportunity in the country. Tomorrow in part two, we’ll look at Azul’s fleet decisions. 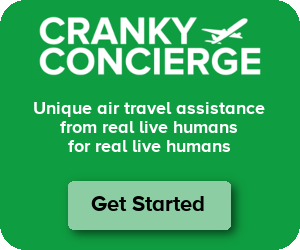 Cranky: With Azul, you’re sort of following a similar path of rapid growth, low cost carrier [like JetBlue] – kind of filling a niche that hasn’t been filled before. I was reading an article recently saying some of the lessons you’ve learned. Every time you start with a new airline, you change things around a little bit. I’m curious with Azul, what are the things you’re doing differently, above and beyond what you’ve done in the past? David Neeleman, CEO Azul Airlines: It’s much different in Brazil than in the US in a lot of ways. If you were to go down and fly Azul, you would not think there was any difference [compared to JetBlue]. But behind the scenes, there’s a lot of market stimulation, and a lot of different things that we do because the market is 1/3 the size of what it needs to be. When we started flying it was about 50 million; then it was 56. I think this year will be 65 but the number should be closer to 150 million. Cranky: There’s clearly a lot of opportunity, but one of the issues in the past has been Brazil’s disorganized air trafic control system. Is that something that’s improving or are you just able to work with it the way it is? David: It’s certainly improving. We’re used to seeing things move a lot quicker in the United States. Here it’s a learning process. They’ll get there. They’ve had, you know, the Gol crash . . . traumautized the country. But they’re very careful and they’re very proud of what they do have. We’ll work with it. We’re not just concerned about the in-the-air stuff as we are the infrastructure on the ground. There’s plenty of infrastructure today in most cities, but as the market starts to grow, there’s going to need to be a lot of new construction of terminals, new tarmacs, parking, to handle the growth. Cranky: Is the airport funding system similar to the US where they build and then the airlines end up paying or is government-funded with no reimbursement? David: It’s an enplanement fee rate – they charge the equivalent of about $10 to $12 per domestic passenger depending on the airport. That goes to Infraero, and Infraero is the agency that governs most all the airports, so for one thing you have one group that does it all which is good. If you have a problem, you go to one source with local management. But they don’t have a lot of experience with temporary terminals and temporary facilities. . . .
We haven’t really had to do that before, because flying in Brazil was mainly for the elite, for the A and the B class. There’s A, B, C, D, and E in Brazil. And now that the C class is growing – there’s a hundred million people in the C class – and C class people are starting to get credit cards, half of them have credit cards. So we’re seeing a lot of new travel and a lot of people are traveling who have never traveled before. It’s easy to see it when you have flights between cities that have never had nonstop service before. Travel has been expensive and inconvenient. Cranky: So the Azul target is the C class? But that’s what we’re seeing. We’re seeing both. We have one market, Viracopos to Salvador, which is kind of like São Paulo to Ft Lauderdale kind of thing. That used to have about 34 people a day. Today there’s over 500 a day. So, we’re seeing that growth in a lot of markets that just didn’t have air service before. It’s great to see. Next up, we’ll dig in to Azul’s fleet choices and then we’ll touch on David bitterness with JetBlue. What did I just hear this week on TV that Brazil is the 5th largest country in the world. Most of the population is along the coast so maybe their travel needs are not as big for the size country they are. Any chances for International codeshare? Maybe like the Virgin airlines we can have the Blue airlines?? The world needs a fourth global alliance. I’m hoping for the Virgin group with US Airways, Jet Airways, some southeast Asia ones, and WestJet/Azul/JetBlue or even Frontier. So really it sounds like he’s taking a page from Southwest here, about 20 years ago..
Is Neeleman still involved in jetBlue? Non-exec? Shareholder? I had a look at Yahoo finance but didn’t see him listed as a personal shareholder which seems very odd. IFE is going to be LiveTV on the Embraers and I believe nothing on the ATRs. Our Father and Dad–of nine is a busy man. He does everything and more! I was watching CNBC on the story of your dad, from school days to present Azul and i am totally inspired, in fact i live by similar principles regarding value for money putting people first and the importance of customerservice. Will he be willing to be my mentor? please advise and I will provide my details. A comment on the graphic – is smoking allowed on Azul? I highly doubt it. But this is the same graphic I use for all my across the aisle posts. Flew Azul from Campinhas to Recife. Decent service, on-time, clean plane, efficient staff, confusing way-finding in the airport and inadequate ground staffing, nice new Embraers. Not bad at all, and a decent price. This market is growing like crazy; they managed to suffer for two months of recession, then hopped on the growth train. Look for good things in this market, and even some innovation.